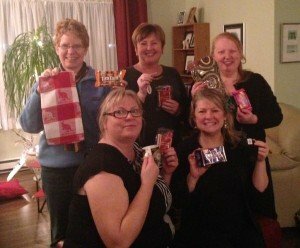 A fantastic book club meeting this evening! 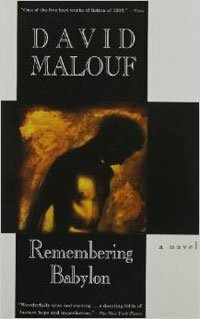 The book was Remembering Babylon by Australian author David Malouf. Set in the 1800’s, it’s the story of Gemmy Fairley a poor British street urchin turned cabin boy, thrown overboard off the Australian coast and raised by aborigines. Sixteen years later an encounter with 3 young children draws him back to his European roots and into a community of less than welcoming settlers struggling to create their home in this strange and harsh land. While most of us enjoyed the story we were often confused – figuring out who was who and what was happening. We all tended to agree that the middle seemed to be missing from the story. The themes of racism, belonging and connection made for great discussion. The author’s writing style was also a big hit and at least 2 of us plan on reading another of his books. Although our Australian host ditched us for sunshine (we’re onto you Catherine!) she did send a wonderful Aussi standin, Jo. Jo offered some fantastic insights into the historical challenges and conflicts between Australia’s European settlers and aborigines. Oh, yes and she brought us a quiz and presents from our sun bathing host! All is forgiven Ms. C. We LOVED our presents!! A big thank you to Kelly for playing substitute host. The apple brie was friggin deadly! (… and I have a bit of a wine buzz as I write this).